I am an Australian documentary photographer. I say "documentary" because I have made it my life's work to document aspects of our world that are rapidly changing. People. Towns. Occupations. Landscapes. It is my life's goal to take important photographs: not "pretty photographs". When I hang up the camera I want to feel that I have made a meaningful contribution to the life and conscience of our planet. My photographic life began after I left my law studies and management consulting career to move to Western Australia's Kimberley region back in 1998. Photography was not something I'd thought of as a career to that point and the camera came along on my early adventures because I was seeing such incredibly beautiful and remote places. My expedition team standing on a suspension bridge over a tributary of the Indus River after the conclusion of my first expedition in Northern Pakistan in 2015. We'd just hiked high up into the Karakorum Range to photograph men mining literally on the sides of 500 metre cliff faces at altitudes in excess of 4000 metres. Being interviewed by Russia’s National Broadcaster in the Russian Far East, Winter, 2018. 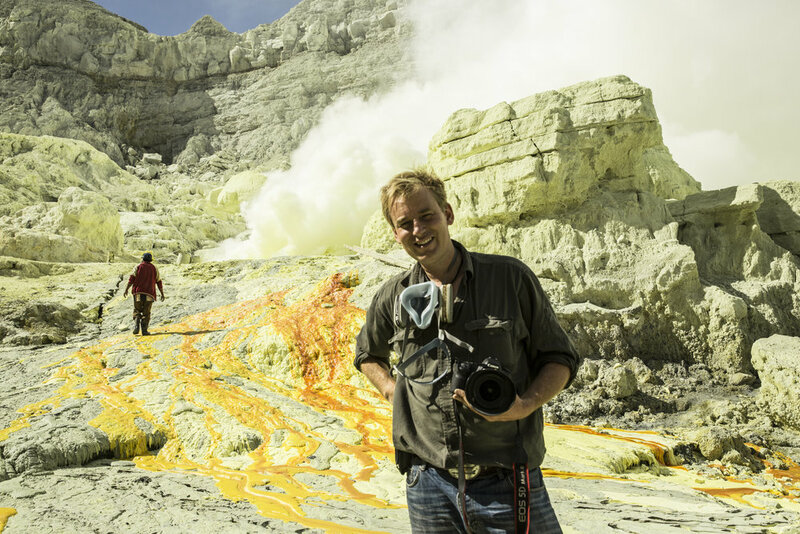 On location in the Ijen volcano on the Indonesian island of Java, 2013. The gas seen in the background is from an active volcanic vent tapping into a magma chamber. Gases can be as high as 600 degrees celcius when they reach the surface. Being interviewed by Australia’s National Broadcaster in my home town of Perth, 2017. Ascending 70 metres up at 500 metre cliff at 4000 metres in Pakistan’s Karakorum Range to photograph gem miners, 2015. Book signing at one of my 2014 exhibitions in China. Me having just emerged from the world’s most dangerous mountain near the Bolivian city of Potosi. Cerro Rico, otherwise known as the mountain that eats men. 2016. With the sand divers of Cameroon’s Douala Estuary, 2017. Being interviewed by Australia’s National Broadcaster in Melbourne, 2018. With the ancient iron makers of the Russian Far East, Summer, 2018. In 2010 I embarked on a unique project to photographically document the lives of this planet’s 30 million men, women and children mining by hand. It is a project that has taken me to some of the world’s most dangerous, remote and spectacular locations. And it has tested every element of my mental, physical and spiritual being just to stay alive, let-alone execute an immensely complex major project. But nothing worth giving in life is easy and a big part of my DNA is making a contribution. Doing what feels worthwhile. I’ve termed this project “Our Cruellest Earth: Man’s Quest for a Better Life”. Because ultimately we can all learning something from these miners. We are all miners at heart.